Kamal gatta is the lotus seed or lotus nut that comes out of the conical fruit of lotus species (Nelumbo nucifera). Many people call Makhana as lotus seeds but that is wrong. Makhana or Foxnut belongs to a different species of water lilies called Euryale ferox. Since both are related species growing in aquatic habitat, people confuse with the identity. 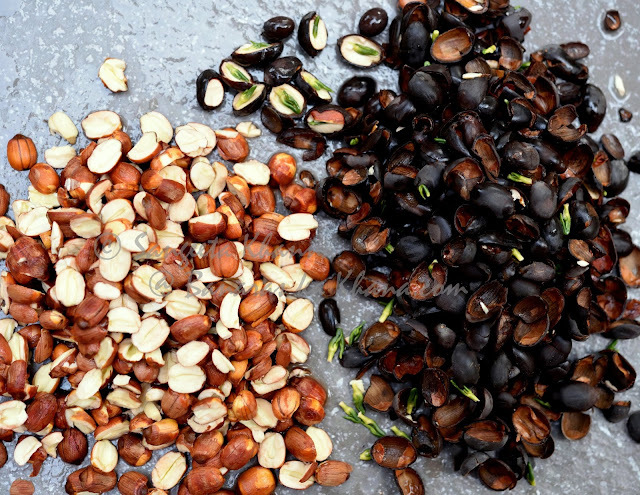 Both Fox nuts (or Gorgon nuts) and Lotus nuts are edible but the usage is different. Foxnuts are popped at high heat to make makhanas and the nuts that don't pop are powdered and made into makhane ka sattu which is available in Banaras during Navratri season as it is a fasting food. Kamal gatta or Lotus nut is never popped as much as I know, please let me know if you have seen popped lotus seeds. Not makhana please. Lotus seeds are eaten in tender fresh form when the fruit is still green and the seeds are tender like green peas. Once the seeds start maturing the inner green coloured germ starts getting bitter and one needs to remove that green germ to eat the seeds. Alternately, Lotus seeds are also dried when mature, the seed coat turns black (dark purple) and hard and the seeds need to be cracked open to release the hard cotyledons which are edible. The green germ is still there and tastes bitter, so one needs to remove that to prepare lotus seeds for eating. Kamal gatte ka halwa is one of those forgotten recipes that I always wanted to cook. The only problem was that the Kamal gatta was not easily available. 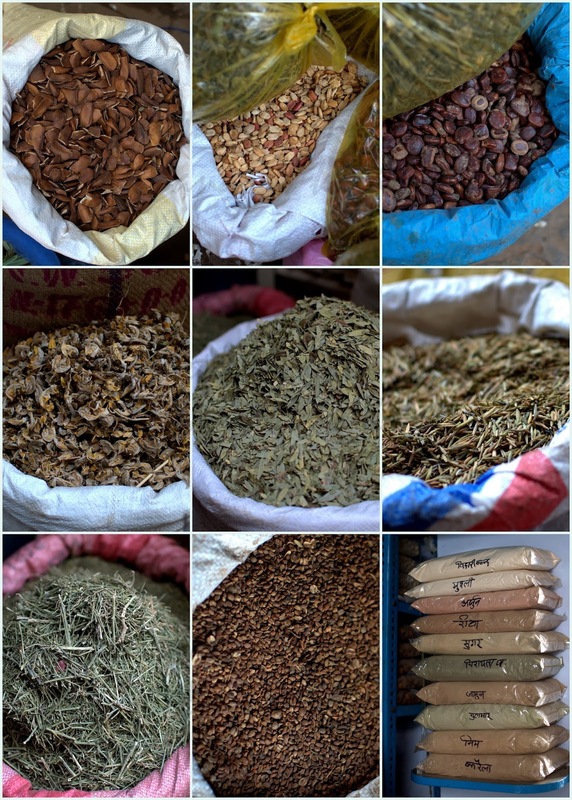 Last time when I went to Banaras we did a walk through the spice market and I found a few spice shops had kamal gatta on the display. I bought some promptly and stuffed it into my handbag. Kamal gatta was placed over a sack of makhanas interestingly, as if to prove the relationship they share. The spice market of Banaras is called Gola Deenanath. It is a lane that starts diagonally opposite to the main gate of Kabirchaura hospital. Apart from spices and nuts, dry fruits etc you would find a lot of herbs and Ayurvedic medicines being sold in the shops and on the pavements. The shopkeepers are quite helpful and help you identify things. My best find obviously was Kamal gatta from this market. Luckily I was there in the season. I realised it later as when I soaked the kamal gattas in water overnight I noticed the green germ (embryo) inside was nice and plump and was ready to sprout. That will happen when the kamal gatta is from the fresh crop, or so I guess. No prizes for guessing that I actually set them apart for making some lotus seedlings. Dreaming of having lotus in my garden now. I have to arrange a deep pot for growing lotus of course. 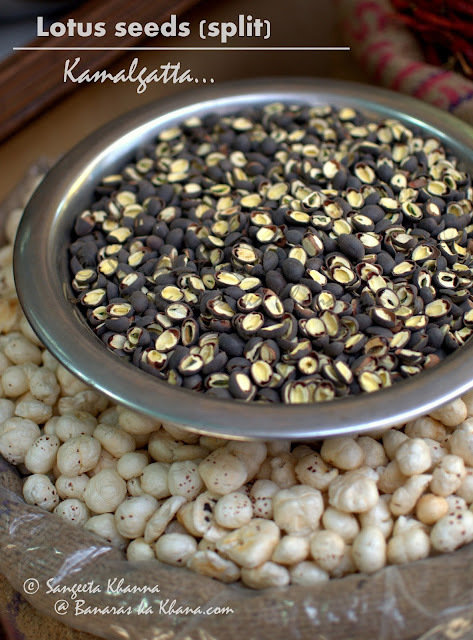 Lotus seeds or kamal gatta was always a rare food because only a very few people cooked it. Separating the seeds from the fruit is quite difficult so even the tender kamal gatta is eaten as a fun snack rather than a staple like lotus stem. Once dry the seed coat is quite hard so breaking it, separating the edible part from the green embryo was so much work that only a few people actually cooked it. But once the seeds are processed they make really good daal with minimal spices or even a nimona that uses very little lotus seeds to make a curry. Halwa was quite common in my childhood as my grandmother used to make it whenever she would get some kamal gatta. I never saw it being made once I grew up enough to understand recipes but I kept hearing about the kamal gatte ka halwa so much that it became a much desirable food in my mind. 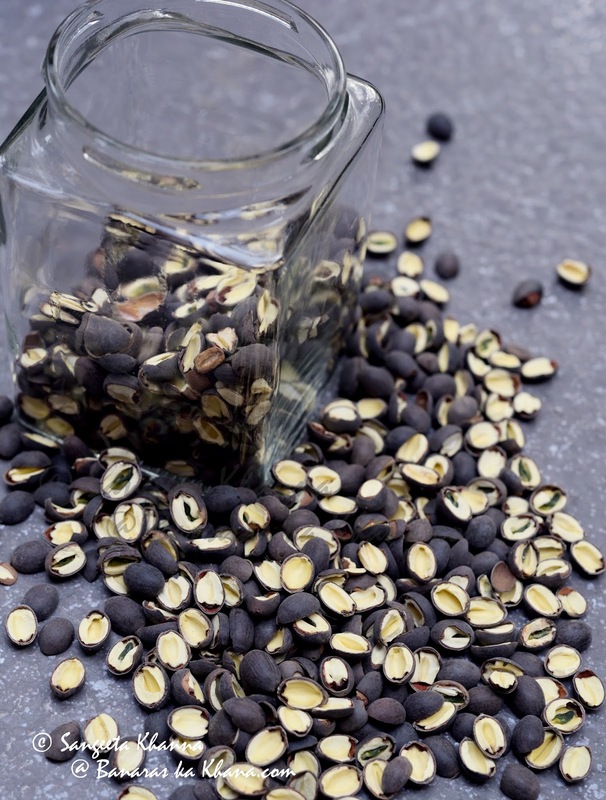 The lotus seeds are known as nerve and cardiac tonic and is also supposed to be anti ageing in it's effect. The medicinal properties are recorded well in Thai texts as well as Indian Ayurveda texts. The book The Yoga of Herbs claims that the lotus seeds are aphrodisiac, rejuvenative and homostatic apart from being calming and sedative in nature. In my family kamal gatte ka halwa was known as the supplement that was fed to anyone recovering from a prolonged illness. Luckily kamal gatta is available in split form else one would need to break every seed that actually slips many times when you hit it with a hammer. At least in the markets of Uttar Pradesh kamal gatta is available in split form I am sure. Cooking the dry kamal gatta is quite a task even when you get them split. Once it is soaked overnight the seed coat needs to be removed from every individual seed, it is tougher than peeling water chestnuts because the seeds are small and the green embryo needs to be removed from each seed. .
Once cleaned, you just rinse the peeled seeds and grind them all in a blender. Some people like the mixture coarse and some like it smooth. Earlier this grinding was done on a stone mortar and pestle called silbatta. I made a smooth paste because I wanted a set halwa that can be cut into neat squares. Kamlagatta has a tendency to set once cooked and cooled. 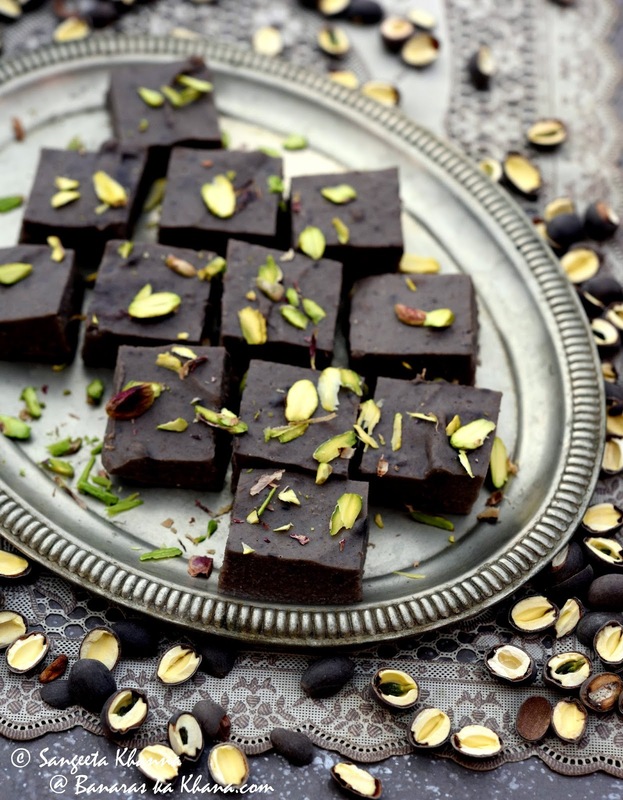 Once the paste is made it is a matter of 15 minutes to make halwa for about 4-6 servings. 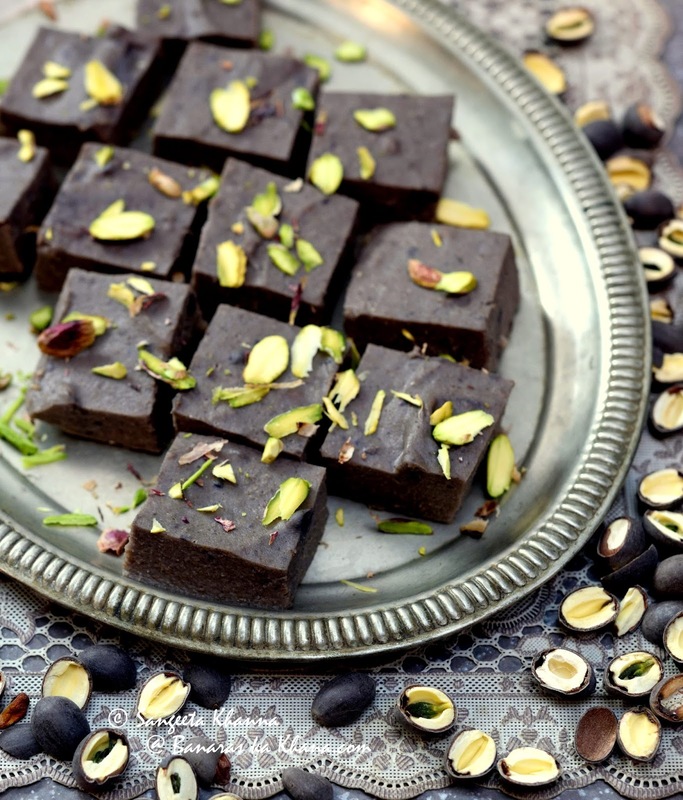 Note that some people make this halwa with kamal gatta along with other nuts as even my mother used to make it. But I think my mother was smitten with her normal mewe ka halwa so much that she would add loads of soaked and blended nuts to all the halwas she made. I wanted to make halwa with 100% kamal gatta so I can get the unadulterated taste of the lotus seeds. Peel the seeds and rinse them once. Make a paste, preferably without adding any water. Heat the ghee in a kadhai ( I used iron kadhai) and pour the kamal gatta paste in it. The paste starts getting sticky once it heats up. Keep scraping the bottom and stir for about 10 minutes to get a smooth and thick consistency. If using an iron kadhai you would see the paste become dark but that is worth it. Use a steel kadhai if you want a lighter colour. Add the sugar or jaggery once the mixture comes together in a smooth lump. Stir and mix, cook for a couple of minutes. Now empty the contents of the kadhai into a greased tray of suitable size and smoothen the surface using a butter knife or spatula. Sprinkle chopped nuts and press them to stick on the surface. Let the halwa get cold before you cut squares or serve hot like a sticky pudding. 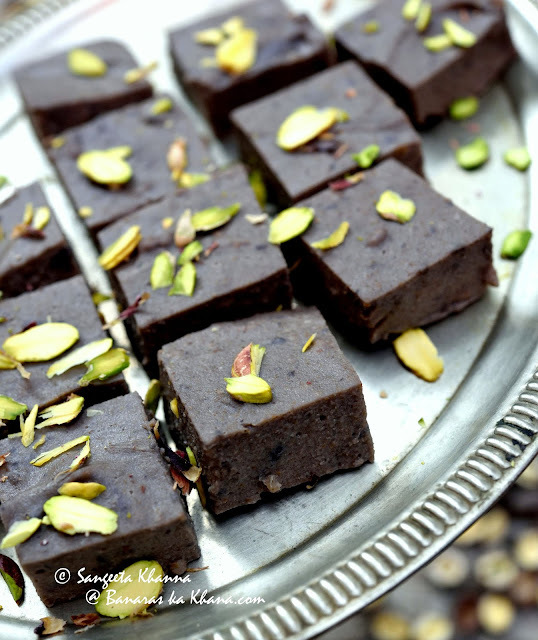 The texture is quite similar to the fresh water chestnut halwa that I make but the taste is very distinctly different. Nutty, earthy and smooth, the flavour of the lotus nut is so mild and yet potent that the jaggery gets camouflaged. 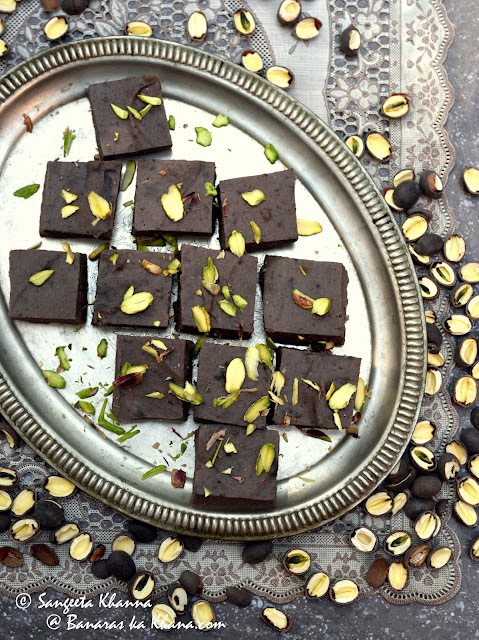 Once the halwa is cold and cut into squares, you can refrigerate it for 3-4 days. Kamal gatte ka halwa was one of the best things I cooked in the last month. It tasted great and it was one of those things I had been wanting to get my hands for so many years. I ahve some more kamala gatta with me, will be using it to make some daal next. Of course the seeds are germinating well and will grow into healthy plants I am sure. surprising, amazing, delicious but easy to cook. Thanks for introducing me to the Kamalgattas, I have never seen them and after reading your post, I'm intrigued. You have taken so much effort in making this halwa. 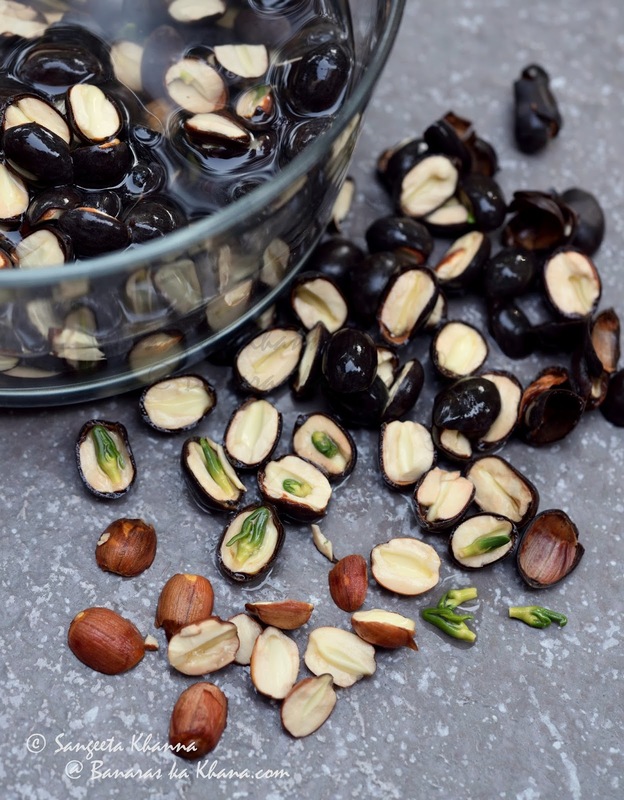 Recently I bought a pack of dry lotus seeds and was so confused on how to use them. Your post has been of great help in understanding. Thank you so much.. 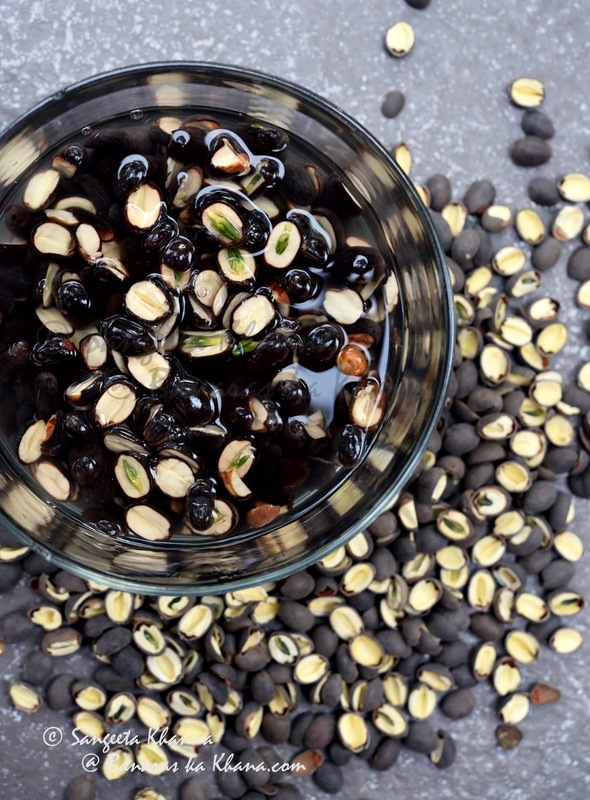 So glad this post about lotus seeds (Kamalgatte) helped. Thanks Gayathri.